The cutting machine is widely applicable for cutting of nonmetal materials in various industries by cutting die. 1.Adopt double oil cylinder, precise double-crank connecting rod mechanism, which can guarantee that the cutting depth at every cutting position is same. 2.With special setting mechanism, and equipped with die cutter and cutting depth setting, the travel adjustment is simple and accurate. 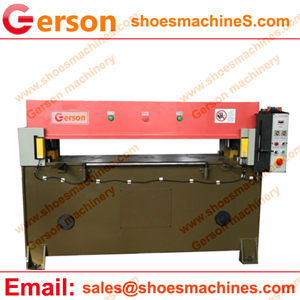 3.The pressing board of cutting carries out slow cutting when it contacts the die cutter, which can make that there is no size error between the uppermost layer and lowermost layer of cut materials. 5.Products of special specifications can be customized.